Last saturday myself and a few friends attended the christmas grace service called 'nine', which is their alternative take on the traditional 9 lessons carols by candlelight service. There was some really good stuff and it was good to go to a service and just be there. I was also a little disappointed, I felt some of the responses to the lessons could have been better if the grace team had worked together on them. As was said at the beginning it was some people's first time at doing something, but I think it should that a team approach is always better than individual one. It allows an idea to develop and grow. I've been watching the new Aaron Sorkin series Studio 60, which is about a fictional saturday night live comedy-sktech show. The week starts with ideas for sketches and then the writers go and develop them, they get tested out and they then make decisions about what goes in the show and what gets left out (or needs development for another week). I think that is something of the approach we should take to alternative worship. The advent explorations services I've been organising have been great because each week I get together with the small group to which we belong and we discuss the advent readings for the coming week and then allow ideas to emerge and develop and then we go away and develop them. Its much better than just me trying to put together a whole service. 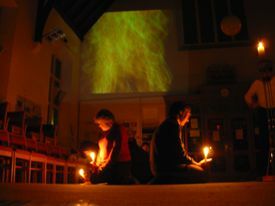 Last night was our second advent service. 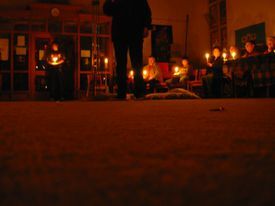 The theme we explored was the coming of the Light into the world. Our reading was Psalm 27.1 - the Lord is my light and my salvation, of whom shall I be afraid? We also video a fire burning, which you can find here - Download fire.mov . Like last year I'm running (with a team this year) advent alt.worship services through the four weeks of advent. Tonight was the first one on the theme of hope. I have been collecting The Independent front pages during the year and we used them to help people get a big picture of this year's news stories, to direct prayers and reflect upon the theme of good news. We then used a great prayer called 'open our eyes' from the Wild Goose Worship book Cloth for the Cradle and thought about signs of hope in our world. We had a good response from people and I was pleased with the way it went. Three more to go. Easter Icons a walk about exhibition with things to do and see that will help you to contemplate, reflect, question and wonder at the easter story (suitable for all ages). That's how I described it. We used readings, pictures (Christ We Share / Pictures of Jesus A + B / plus others) and sculptures and symbolic actions. These were designed to help people take a fresh view of the easter story, shake us out of our Western picture of Jesus and engage and involve us in the easter drama. We were open from 12-8pm yesterday and we had over 100 people come and visit. You can see photos and some of the stuff used here. 3. Jesus is disowned by Peter (Luke 22.54.62) - Andy Goodliff | reading: 'I did not know the man' from Open to Judgement: Sermons and Addresses, by Rowan Williams (1994, DLT) | symbolic action: Peter leaves his fishing nets to follow Jesus, walks on water, is called Satan, is named the future leader of the church, denies knowing Jesus, and is forgiven and reaffirmed. With Peter what you see is what get. This man has strengths and weakness. In saying ‘I am Peter’ we recognise that we are disciples-in-training, people whose lives bear fruit and also live among weeds. Write down your strengths and weaknesses around the statement ‘I AM PETER’ acknowledging and accepting who you are and asking God to continue the work of transforming us in to the image of Christ. 4. Jesus before Pilate (John 18.33-19.16a) - Helen Swinyard | symbolic action: Pilate asks Jesus what is truth? He wants Jesus to explain truth in propositional terms – statements which can be proved or disproved. Jesus remains silent, because he is truth: the truth of God, who reveals the truth about he world and humanity, who reveals the truth about ourselves (see John 3.16-21). Jesus gives Pilate his answer not in words, but (ironically) in crucifixion and resurrection. Jesus is truth embodied, truth given flesh. We encounter the truth of God not in following a scientific theorem or philosophical argument, but in facing the face of the crucified and risen Christ and following on his coat-tails. As a reminder, write the name Jesus using any of the materials on the table and take it home with you. 5. Judas betrays (Matt. 26.14-16, 47-50; 27.3-10) - Hannah Goodliff | reading: 'the Judas I Never Knew' by Kester Brewin (Complex Christ blog) | symbolic action: The tradition of the church has been prone to making Judas one-dimensional, to make him something less than human. Judas’ moment of betrayal is also a moment of revelation as he finally recognises completely that Jesus will not be made to fit Judas’ expectations of the Messiah (hat-tip to Kester Brewin). When Judas throws the money back at the chief priests, it is a sign that he has let go of his agenda for Jesus. As you are invited to throw the coins into the baptistry, let it be a sign of repentance, a sign that we let go of our attempts to mould Jesus into our image and rather we allow Jesus to mould us into his image. 6. Simon of Cyrene helps carry the cross (Luke 23.26) - Miriam and Ella Pugh | symbolic action: Jesus did not just talk about ‘taking up your cross’, but picked up his cross and carried the means of his death through the narrow streets of Jerusalem to Golgotha. As a sign of your commitment to walk the way of the cross, lift up the piece of wood (it was heavy!) and pray. 7. Jesus on the cross (Mark 15.36 [24-36]) - Hannah Goodliff | symbolic action: Golgotha where Jesus was crucified would have had the smell and taste of death, a place where hope appears absent, a place where God appears absent (the cry of Jesus is the cry of abandonment). Soak a piece of sponge in the bowl, smell and taste the vinegar as you read the passage. Do you identify with Jesus’ cry of abandonment? The story of Easter, the story of the Christian faith is a story where hope can appear absent, where God appears absent. Yet the words of Jesus before he dies ‘It is finished/complete/accomplished’ are a flicker in the deep darkness that hope is not lost. 10. The curtain is torn (Mark 15.37-38) - Helen Swinyard | symbolic action: The temple curtain tearing into is a sign that the way to God is open, through Jesus we die to sin and self and live for God. On the piece of paper draw or write anything that gets in the way of your relationship with God. Then tear it in half as a sign that through Jesus you are accepted and forgiven. 11. Facing the face of Christ (2 Cor 3.18; 4.6) | symbolic action: As we face the crucified and risen Jesus, as we live our lives before him, as we seek to follow in his footsteps, so we believe we are transformed. Salvation is not just a saving from sin and death, but a saving for a life that ‘loves mercy, acts justly and walks humbly with our God’ (Micah 6.8). Take a picture of the face of Jesus home with you and stick it on your fridge or bathroom mirror to help you live before, and seek, the face of God. Thanks to my awesome team - Hannah, Helen, Ashley and Richard (we were at the church setting up thursday night from 9pm-1.30am) and those who contributed artistically - Sarah and Naomi, Jude, Rosie, Edna, Freda, Steve and also my dad for helping me with some of the reflections. I have been exploring the use of abstract and natural images for God for two reasons. The first is a desire to contribute something to the languag eof gender equality without playing fast and loose with essential beliefs about God. Many women in the church struggle with a God who is always spoken of in male language, as if God was more real to men than to women - or that somehow women have less of a stake in God. But it would be too easy to substitute female language and reverse the problem. God is not woman or a man, God is God. How best to employ God-language is a debate that will run and run. The use of gender-free images is by no means the whole answer, but in the meantime gives some alternative ways of voicing our praise to God. The second is that I am heartily tired of religious jargon. Contemporary worship writing seems to have a grat fear of the use of natural and abstract images for God, and stays within the risk-free and theologically explicit zone of such images as the blood of the lamb, or bowing before the throne of God ... these are valuable if we ever have the time to think about them. Too often, through, our minds get stuck in a rut because the familiarity of such phrases serves to hide their meaning, not reveal it. We live with a choiuce - we may opt for the safety of spiritual certainties, limiting the risk factors and never having too much of a spiritual crisis. Or we may go closer to the edge, and let our faith be turned upside down for the sake of a clearer revelation of God. But the revelation, in my experience, is of a bigger, kinder, more liberating God than I ever imagined possible. This God is truly a rock in a storm, a warm breath on a frozen heart. So - Elements is my latest experiment in framing answers to the big questions: Who is God? What is God like? So the journey goes on. Both in words and music - which can in itself express ideas which are beyond words - Elements is a fragment of my imperfect attempts at understanding God. i hope it sparks off some fresh inspiration for you in your own search. What I like about this, is the intelligence of the theological reflection. Maggi's thinking and songs are shaped by her theology, which seems a cut above the usual worship songwriter, who's theology is so often hit and miss or simplistic. Buy the album, it's worth it. Here's hoping Maggi finds some more time to get into the recording studio. We completely changed the church space. As the congregation arrived they look very uncomfortable, and a few people left. By the end I think the majority of people really valued the time and felt God really spoke to them through one or several of the stations. This is the first time I've done something so alternative in a morning service and it was, if anything, an interesting experiement to see how the church coped. There would be a few things I'd do differently again, but on the whole I think it was creative and accessible to all ages, which is the aim of our whole church services. A prayer I wrote for parallel universe event at Baptist World Alliance Congress 2007. Hannah and I have booked on to this year's Greenbelt - 26-29 Aug. It should be good. I went a few times during the mid-90s when it was at Corby and once back in 2000 I think for a day. From 1998 until last year I went to Soul Survivor, but this year just held no real appeal and my young people were slow on the uptake. Looking forward to hearing maggi, David Ford and also Simon Hall and Revive lead some alt.worship. Music wise I'm looking forward to Iain Archer.